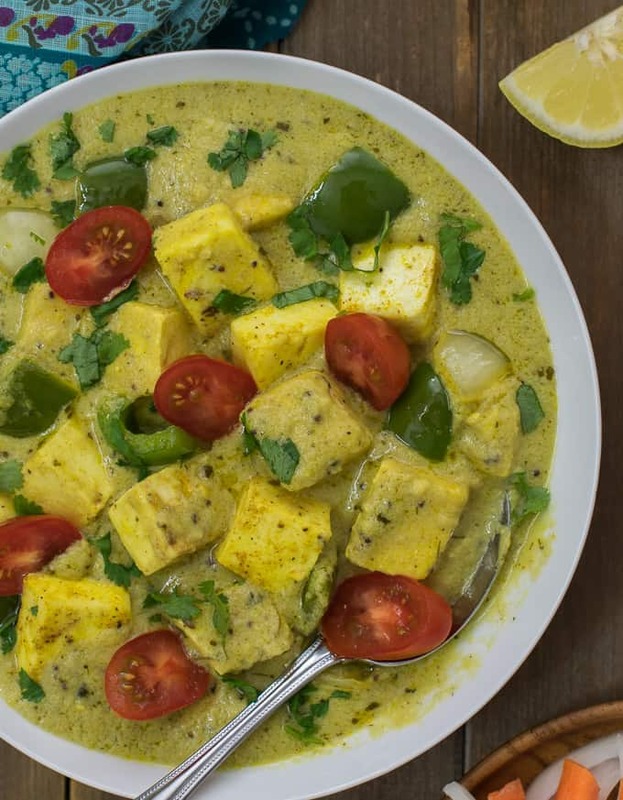 Pepper paneer in yogurt gravy is a tasty and easy paneer recipe that fits great for everyday menu. If you are on a look out for a different paneer recipe which is not the same old paneer tikka masala or kadai paneer then you will love this recipe. Moreover this paneer gravy recipe has no tomatoes or heavy cream . It involves quick and simple preparation and takes less than 20 minutes to prepare from scratch . We all love paneer , don’t we? We are a house of Paneeraterians – a made up word of course. But seriously guys we can eat paneer anytime of the day. I constantly try to create new recipes using paneer because the same old paneer tikka masala can get a bit boring.Pepper Paneer in yogurt gravy is a rich and delicious recipe without being heavy on your tummy. We call it as paneer in dahi ki curry. Paneer is a great source of protein and including some in your diet everyday is a good idea!This particular paneer recipe is like a breath of fresh air. From flavors to the color ,everything is so different than the standard paneer preparation. Though this paneer with gravy recipe is made without using tomatoes , the taste is spot on!Using yogurt instead of heavy cream makes it desirable for everyday meal too. What is this easy paneer with gravy made of ? I have ditched the tomatoes and instead used onions as the base of the gravy. This paneer recipe is made with clean simple spices . The richness for this gravy comes with cashews and yogurt instead of milk or heavy cream. You might even like this lush green Palak Paneer recipe that uses a secret ingredient- Recipe link here . Paneer bahara- yet another everyday paneer subzi recipe- Link here. A yogurt based easy to prepare paneer in gravy recipe which is way different yet as delicious as the classic paneer tikka masala! Grind all the ingredients called for making a paste. Once warm add in the mustard seeds and bay leaf, hing. When the seeds start spluttering add in the prepared paste . Be careful as the mixture might splutter. Add in the turmeric, coriander powder, garam masala , pepper and some salt. Add in ¼ cup water for cooking. Cover and let the mixture cook for 4-5 minutes stirring occasionally . In the meantime whisk besan into yogurt until lumpfree. Add this mixture to the pan stirring continuously until the gravy is blended . Add in more salt if necessary, kasoori methi, amchoor powder, sugar and remaining 1 1/2 cups water. Let the gravy cook on low for 5-8 minutes. In another non stick pan heat some oil on medium. Add in Bell Peppers and onions , cook it for 2 minutes. Now add in the paneer and increase the flame to HIGH. Sprinkle some salt and pinch of turmeric. Cook it for 1 minute tossing mid way or until the paneer is light golden brown. The veggies should have a crunch and not very soft so adjust cooking time accordingly. Add the veggies and paneer to the gravy and mix it well. Let it simmer for 2-3 minutes and switch off the flame. Taste test and adjust any seasoning if needed. Just before serving top it with some cilantro and cherry tomatoes and some lemon juice. Serve warm with phulakas, naan or rice. Spice level of this recipe is 3 on 5 , 5 being hot! So adjust spices to your taste accordingly. Roasting besan is optional, gives an earthy taste. You may choose not to roast. The gravy will thicken more as it cools. Substitute amchoor with lemon juice. Hope you like this recipe on Pepper Paneer in yogurt gravy and do give it a try. I would love to hear from you. Love being here , don’t miss a single recipe. Subscribe now – it’s free and get every recipe in your inbox. Subscription box is on the home page and below every recipe post.If you have tried any of my recipes do drop in a feedback in the comment section or on my Facebook page carveyourcraving in messages section or tag me @carveyourcraving on instagram. Thank you . Do give it a try! Thanks for the detailed recipe! We love Paneer too. Will try this soon.. looks so good. Love the paneer experiments!!!! Now I know what to delight myself with ….